Sand compaction piles are one of the potential methods for improving ground stability, preventing liquefaction, reducing settlement and similar applications. This method involves driving a hollow steel pipe into the ground. The bottom is closed with a collapsible plate down to the required depth and then pipe is filled with sand. The pipe is withdrawn while the air pressure is directed against the sand inside it. The bottom plate opens during withdrawal and the sand backfills the voids created earlier during the driving of the pipe. The sand backfill prevents the soil surrounding the compaction pipe from collapsing as the pipe is withdrawn. During this process, the soil gets densified. 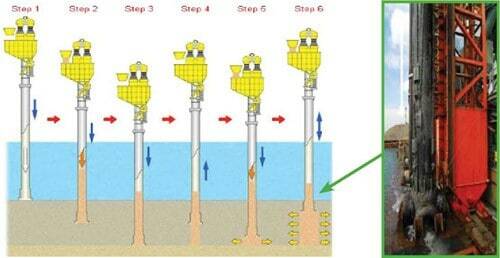 There are two types of Sand compaction piles method depending on the system deployed. First one is vibratory system with vibro-hammer and the other one has a non-vibratory system with forced lifting or driving device. The vibratory sand compaction piles were developed 50 years ago and has been used in more than 380,000 km of improved ground. But the vibro-hammer used in this method has a negative effect in the form of vibration and noise to the surrounding environment which makes it difficult to use this method in the urban areas or at locations close to existing structures. To avoid these problems, a system with a non-vibratory Sand compaction pile method was developed, which does not require impact or vibration on the driving device to penetrate into the ground. The equipment consists mainly of a sand compaction pile driving device used as a base machine and a forced lifting or driving device with a rotary drive motor to rotate the casing pipe. Set the casing pipe to the predetermined place. By operating the forced lifting or driving device, install the casing pipe into the ground while rotating. The sand is fed through upper hopper after the pipe has reached the required depth. Casing pipe is pulled up which results in the sand being pressed out to the void by compressed air. The casing is then extracted along with the compaction of the pressed out sand pile so as to enlarge it. Above procedure is repeated till the sand piles are formed to the ground surface. The primary advantage of these sand piles is that the sand used is often considerably cheaper when compared to other similar ground improvement techniques like stone columns. Construction of the sand columns is extremely fast. After creating the hole, it’s fully supported by casing during construction that prevents the possibility of collapse. Sand compaction piles have a low stiffness when compared to other methods. Hence larger percentage replacement of weak soil is required. These piles do not have sufficiently high permeability to function as effective vertical drains during earthquakes. Sand compaction piles are a possible solution for strengthening pervious embankment foundations found to be susceptible to liquefaction or impervious foundations susceptible to stability problems like during an earthquake.